I start in race one, with PAGEANTRY for Anthony Freedman. She has had one run this time in where I rode her and I thought she ran well enough on a track that she was unsuited on. Hopefully today she gets firmer footing and it will be interesting to see how she performs on better ground. MURAAHIB is my ride in race two, for David & Ben Hayes & Tom Dabernig and he races in the Shadwell colours. He was a very pleasing run first up when beaten by Merchant Navy where he had the blinkers on first time. He now steps out in trip and has come up with a more favourable draw and I expect him to be one of the main chances in this competitive race. In race three, I ride THEANSWERMYFRIEND for Robert Smerdon. He is quite a dynamic horse who loves to make all the running. He now steps out to a trip that he has had two wins and two seconds from four starts at. He has drawn the outside gate but if I can manage his speed and the track is playing even, he is going to take a lot of running down especially on the minimum weight. SO SI BON is my ride in race four, the Group 2, Bobbie Lewis for Robbie Laing. He has had two runs this time in and both times he has closed off well and finished second and he has shown a liking to the straight course. He does get back and comes into this nicely under the Set Weights & Penalties conditions but it is a quality race but he will be closing off nicely. Race five, the Group 2, Danehill Stakes, I ride the unbeaten JUKEBOX for Ciaron Maher and he wears the Colin McKenna colours. I was impressed with his first up run in the Vain Stakes and the stable is delighted with the way he has trained on since then. He has come up with an inside barrier draw and by the time this race comes around, it will be known if that is an advantage or not. In this high-quality field, hopefully he can remain undefeated. EXOCET is my ride in race six, the Group 2, Let’s Elope Stakes for Anthony Freedman and wears the Pinecliff Racing colours. I won a Listed race on her at the end of her last preparation over 2000m. She is resuming and does have nice form over shorter trips but she has an outside draw. This is a high-quality race and if it is run evenly I would expect her to be closing off well. This race should give a good guide as to where she will measure up in the feature Mares races over the Spring. In race seven, the Group 1, Makybe Diva Stakes, I ride SEABURGE for David & Ben Hayes & Tom Dabernig and he wears the Colin McKenna’s colours. If he finds his best 3yo form which saw him run second at this level and track, from an inside draw, he should be competitive. YOGI is my ride in race eight, for Darren Weir and he goes around in the Australian Thoroughbred Bloodstock colours. He is yet to miss a place from five runs this preparation which has included three wins. He now steps up to Listed grade but gets in on the minimum. He relishes the long straight and extended trip but he does takes a lot of encouraging. He is high quality and this will show where he fits in the top class staying races this Spring. In the last race, race nine, I ride COOL CHAP for David & Ben Hayes & Tom Dabernig. I did his barrier trials before he resumed with a good run when beaten just over a length. He now steps up in trip but he does have an ordinary barrier. It will be interesting to see how the track is playing and what my instructions are but with luck from the draw and usual form he will be competitive again. Today I race at Moonee Valley and the rail is out 3 metres on a Good surface. I start in race one, with SEA THE SPARKLE for Darren Weir and she wears the Waratah Thoroughbred colours. I finished second on her last start behind Hell or Highwater, which has sinced franked the form, and my previous ride on her I was successful at Flemington. She has drawn well, will be improved from her last effort and comes into this race 2kgs off the minimum. There looks to be nice pace, she is versatile and I think the track will be to her liking. She is the horse they have to beat. ABERRO is my ride in race two, for Matt Laurie. His overall form is excellent even when you look at his Maiden races when he finished behind Merchant Navy and Eshtiraak and his last run as a 2yo he featured in the Group 1 Champagne Stakes. He resumed with a win at Sandown and defeated a horse I won on Wednesday. He now steps up in trip which looks like it will suit him, he has the minimum weight and the field size has been depleted due to scratchings. I expect him to make it two from two this preparation. In race three, I ride BRAHMOS for John Sadler. He has only had two starts for a debut win and then a second at his latest outing against older horses. I have a lot of time for him and think he is going to be a lovely horse with a big future and this is his next step. This is a very competitive race but I expect him to be one of the main chances. RULING DYNASTY is my ride in race four for Darren Weir and wears the Dato’ Tan Chin Nam colours which may be an omen as the main race today is named in his honour. On his most recent form he will need all the genius of the leading trainer and the omen to be on his side. Race five, the Group 2, McEwen Stakes, I ride HOUTZEN for Toby Edmonds. She was a dominant 2yo and her only defeat was in the Golden Slipper and that was on Heavy ground. She comes into this race with 50kgs. She has drawn the second outside gate and there does look to be a lot of pressure and speed up front. She is a natural running type of horse and it is my first ride on her. I did watch her work at MV on Tuesday and the reports are she got around the course well but it is her first try at going this direction. This is a strong race and it will be a great test for her against the older horses but I am confident in her stamina, speed and ability. BANISH is my ride in race six, the Listed, Atlantic Jewel Stakes for James Cummings and she wears the Godolphin colours. She has won her last two starts and I was aboard when she resumed when she came from a long way back on Heavy ground. If she can reproduce that performance on a firm track, she will be competing at this level all through the carnival. She has come up with a wide draw and it will be interesting to see how the track is playing and what my instructions are. She did give me a good feel last time and I’m looking forward to riding her on a firmer surface. In race seven, I ride EL DIVINO for Darren Weir and wears the Fairway Thoroughbreds colours. Last preparation he competed in Group 1 & 2 races and runs today in a Listed race on the minimum weight. He has drawn a nice middle gate, has nice speed so makes his own luck. It has been 18 months since his last win, so it will be nice to get a win on the board. ARTICUS is my ride in race eight, the Group 2, Dato’ Tan Chin Nam Stakes, for Darren Weir and he goes around in the Australian Bloodstock colours. I was pleased enough with his first up run and the step up in trip is to his liking and he did win second up last preparation. It is a small field and looks to be quite tactical and he is a chance in this solid Weight-For-Age race. In the last race, race nine, I ride ETYMOLOGY for James Cummings and he wears the Godolphin colours. Last preparation we saw him competing at extended trips where he ran in several Derby races. He resumed after a couple of trials with a solid third in a competitive race. He now comes back to Melbourne and steps up in trip which looks suitable. The middle gate should give him every chance to get into his rhythm and be in a comfortable position. If he is in the finish, he will have an exciting Spring ahead, as this race has a lot of depth. Today we are racing at Sandown on the Hillside track, the long course. We had a lot of rain overnight and they are predicting gusty winds, so it will be interesting to walk the track and see how the wind will affect how races are run and won. I start in race two, with WASSERGEIST for Trent Busuttin & Natalie Young. He has only had two runs and they have both been at this course and I rode him last start where he was beaten by a nice 3yo. He was slow out last start from a wide draw when ridden back but he gave me a great feel and had good acceleration and just missed on the line. He has drawn better today with the scratchings and should put himself in a more favourable position and be hard to beat in this competitive maiden. ARTIES DREAMWINNER is my ride in race three, for Dan O’Sullivan and she wears the John Richards colours. 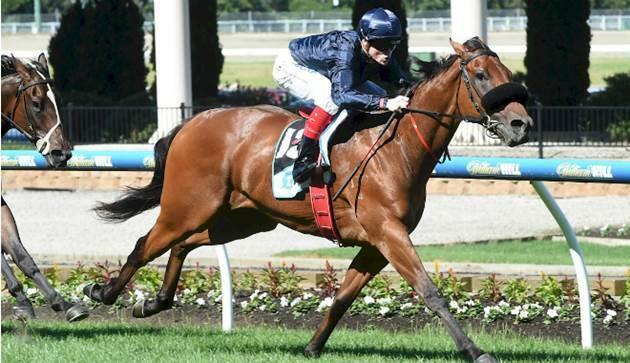 She has had two runs this preparation for a win and a last start second at Sandown Lakeside. She makes her own luck by going forward in her races. She has drawn favourably with the inside gate, has the minimum weight and any rain would only enhance her chances. In race four, I ride SIMPLY INVINCIBLE for Peter Morgan. He has been very consistent apart from his last start effort. He did take a lot of running down, at an extended trip, when I beat him on Yogi here a few starts ago. He was ridden last time with a sit and it will be interesting what instructions I’m given, as he failed to finish off when ridden that way. It is a small but competitive race, and if you forget his last run, he is the one they will have to run down. AMADEUS is my ride in race five for Mick Kent. He is first up and I have ridden him to victory at both his wins. If he was to produce his best form, he is the horse they have to beat. Race seven, I ride CARRAIG AONAIR for David & Ben Hayes & Tom Dabernig and he wears the ATB colours. I won on him last start at the course and he know steps slightly up in trip which I think could be too his advantage. I like how last time he was able to be ridden closer to the speed and was very effective doing this. I thought he won very well and should be able to take the next step and I’m hoping he doesn’t disappoint. Today, I’m racing at Caulfield and it is an exciting day, as it is the start of Spring Carnival featuring the Group 1, Memsie Stakes. I start in race three, with BEZEL for James Cummings & Godolphin. He had very good form as a 3yo and he is resuming this preparation. His first up form is very good as he has only missed a place once. He has won at the distance and trialled nicely leading into this. If he shows his 3yo form, this is a nice race for him. TREKKING is my ride in race four, the Group 3, McNeil Stakes, for James Cummings & Godolphin. He had very good form as a 2yo. He is now second up after a nice run when resuming in Sydney. It is his first go left-handed but barrier two gives him every chance to get around the tight and tricky turn. His form is solid enough and with an economical run from the nice draw, he is one of the main chances. In race five, the Group 3, Cockram Stakes, I ride FUHRYK for David & Ben Hayes & Tom Dabernig. She has only been beaten once at the distance and she ran second on that occasion. She clearly has the best form first up, at the distance, at the track and if she maintains her form from last preparation, they all have to beat her. SHEIDEL is my ride in race six, the Group 3, The Heath Stakes for David & Ben Hayes & Tom Dabernig. She is a specialist at the distance, having had three starts for two wins and a second. She has come up with a very favourable barrier draw, is a Group 1 winner and has a great first up record. She is very speedy and will take a lot running down. Race seven, the Group 1, Memsie Stakes, I ride VEGA MAGIC for David & Ben Hayes & Tom Dabernig. He has had two runs for the stable for two wins and my only ride on him, I won the Goodwood. On his return, he won well with 60.5 against a quality field in Listed company. He now steps to 1400m, where he is one from one. He has come up with a favourable barrier draw and seems to make his own luck. He is very tough and hopefully he can continue his great winning record. TALLY is my ride in race eight, the Listed, Heatherlie Stakes for James Cummings and Godolphin. Last preparation, his victory in the Mornington Cup qualified him for the Caulfield Cup. He was also competitive at Group 1 level last time in and I feel the break will have helped him become more seasoned for this Spring Carnival. He ran well first up, running second and he now steps up to a more favourable trip. He has a nice middle draw and in this competitive race, he will be thereabouts. In the last race, race nine, I ride GRANDE ROSSO for David & Ben Hayes & Tom Dabernig. I have had one ride on him for a win, on Pakenham Cup Day and he has been ultra-consistent since then. He has drawn a wide barrier but he is in great form and I’d like to make it two from two on him. Today’s races are on the Hillside track, the long course, and the rail goes back into the true position. I start in race one, with PAGEANTRY for Lee & Anthony Freedman. She won on debut and she was very consistent in Stakes grade at her last preparation. She is resuming and I did trial her in preparation for this race where she did trial nicely. This is a very competitive race but I expect her to be one of the main chances. ORACABESSA is my ride in race two, for Robert Smerdon. I finished second on my only ride on her, in Maiden grade. She has handled the undulations of Sandown quite well. At her last two starts, she has raced on the synthetic track at Pakenham, which saw her win and run second but she does have soft track form also. She has come up with a wide barrier draw but if I can get some luck, she will make her presence felt especially on the minimum weight. In race four, I ride SOUFFRANT for Darren Weir. He resumed last start in a new stable and was successful on a soft track at Bendigo. He started favourite, so he was expected to win and he delivered. I expect him to come on with that experience and confidence. He has come up wide barrier but he does look like a horse with plenty of potential who can make it two from two this preparation. ITS TIME FOR MAGIC is my ride in race five for Chris Waller. She is having her first run in Australia. She started her career in New Zealand where she had nice competitive form at Stakes grade but she does only have one win to her name. She has trialled nicely in Sydney leading into this and has a very favourable draw with the inside draw. Race six, I ride GIBBON for Wendy Kelly. He has been a model of consistency this preparation and I have had two victories on him from my last four rides. He has drawn a wide gate and is at his favourite track and distance. He gets in nicely at the weights but this is a very competitive race. He is in great form and he should get all the favours today. UBIN THUNDERSTRUCK is my ride in race seven, for Darren Weir. He has been racing in great form this preparation and was competitive at Sandown and this distance last start. He has come up with a more favourable draw, comes into the race on the minimum weight and he should get an economical run from the barrier. In a very strong staying race, he is one of the main chances. I start in race one, with ELLENROH for James Cummings and she goes around in the Godolphin colours. She has only had one start and closed hard behind the impressive Shamar, and I like the way she finished off. She is now resuming this preparation and the stable is confident. I have had a sit on her at Moonee Valley on Tuesday, so I have a good understanding of her. She is a lovely filly that has nice acceleration. She has a favourable draw but the heavy track is a question mark. If she does handle that, she will take a lot of beating. CHEZ DUMONET is my ride in race five, for Darren Weir. She is coming off a disappointing run last start where she was well beaten but nothing could be found wrong with her. Prior to that she won her Maiden well. She has been placed at her only run on Heavy ground and if you can forgive her last start and runs up to her prior performance, then she can be competitive in this strong BM64 race. In race seven, I ride BANISH for James Cummings and she goes around in the Godolphin colours. She has only had three starts and never been out of the top three. She won at her most recent start at Ballarat on soft ground. She has had a spell and resuming. She has come up with an outside draw and if we have luck from there, I would think she will be hard to beat. LOPARTEGA is my ride in race nine, for Doug Harrison. I have ridden her on two occasions for a win and a second. She is resuming and she has got the blinkers on for the first time. The only reservation I have is if the track is very wet as she has been unplaced her three goes on soft ground and she has never been on the heavy before. On her best form, she will be very competitive in this even race. I start in race one, with CHARLEVOIX for David & Ben Hayes & Tom Dabernig. I’ve had three rides on him for two wins and I finished fifth on him last time when he was a certainty beaten when I didn’t get any clear running on him. When he did get out, he stormed home. If he brings his form that he shown all preparation he is the horse they have to beat. FRAGONARD is my ride in race two, for James Cummings and she goes around in the Godolphin colours. She has excellent first up form. She has raced at the track before and has come up with a very favourable barrier draw on the inside.She should get a very economical run and take a lot of beating. In race three, I ride TULIP for David & Ben Hayes & Tom Dabernig and she wears the Coolmore colours. I rode her to victory on debut at this track and I thought a lot of her as a 2yo in the Autumn. I have trialled her in preparation for this and like the way she has come on. I think she is a horse with high quality and is one of the top 3yo fillies. She is versatile how she can be ridden as she goes well on speed and has a great acceleration if ridden back. If she shows her ability that I think she has, she should be winning this. BLING DYNASTY is my ride in race five, for Paul Preusker. She is undefeated at the track from two starts and both times I rode her. She had a long layoff before this preparation and Paul has done a great job to get her back in great order. She has come up with a great economical draw, has the minimum weight and will take a lot of beating. Race six, the Listed, McKenzie Stakes, I ride BANDIPUR for James Cummings and Godolphin. He has been excellent this preparation with two wins and a second. He has showed versatility as he has taken up all the running and come from off the speed. He comes into this with race fitness and has a nice draw. He is one of the main chances in this competitive race. LADY ESPRIT is my ride in race seven, the Listed, Carlyon Stakes for Ciaron Maher. She has excellent form at the track and distance. She has come up with a nice favourable barrier draw and there looks to be a lot of pace in the race which usually suits her. If she gets the gaps at the right time, I expect her to be one of the main chances. In race eight, I ride I’M FEELING LUCKY for Darren Weir. She is from Perth where she had strong form and is now having her first start in Melbourne. She has come up with a tricky draw and will need luck. If she does get some luck, and brings her WA form, she will make her presence felt. Race nine, the last race, my ride Is RUETTIGER for David & Ben Hayes & Tom Dabernig. I have won on him twice but both times have been down the straight at Flemington. His last run at Moonee Valley he finished third in a stronger race but he is quite an awkward horse. If I do get a smooth run and he races well for me, this is a race he can win. I start in race one, with SHELLEY BEACH for Stuart Webb. She is having her debut run and she has trialled nicely officially and at her latest trial unofficially at Caulfield. She looks like she has nice speed. She has drawn wide but it hasn’t been a disadvantage to be drawn out in 1000m races at Sandown recently and she should make her presence felt in this. SKY PUNCH is my ride in race two, for Lee & Anthony Freedman. He is lightly raced and has only missed a top three finish on one occasion. He has come up with an inside barrier, goes slightly up in trip and should get a favourable run from the draw. He meets a couple of horses he met last time, better at the weights and in this small and competitive field, he is one of the chances. In race four, I ride JOURNEYGIRL for Mitch Beer & Max Hinton. She was successful last start at this track on Heavy ground. She now steps up in trip and has come up with a favourable barrier draw with the inside gate. She should get an economical run from the barrier and there does look to be plenty of pressure on speed. She comes into this with confidence and I expect her to be competitive yet again. CARRAIG AONAIR is my ride in race five, for David & Ben Hayes & Tom Dabernig and he wears the Australian Thoroughbred Bloodstock colours. He has been very consistent at his last three runs on the synthetic track and today finds himself back onto turf. He seems to close his races off very well. He has come up with a wide barrier draw and there does look to be a lot pressure. If the track is playing evenly, I expect him to be finishing strongly. Race seven, I ride BRAHMOS for John Sadler. I was impressed with his debut win where he skipped a Maiden and went straight to a Benchmark 64 race backing up the big opinion his trainer has of him. He is back to the track he was successful at and he goes up slightly in trip which should suit him. This is a very competitive race but the feel he gave me on debut, I expect him to step up. CLAIRVAUX is my ride in race eight, for Matthew Williams and he wears the Australian Thoroughbred Bloodstock colours. It has been just over 12 months since this horse was successful which was at this trip. He has been racing well without getting into the money. He has come up with a nice middle barrier but he does usually get back and finish off. If the track is racing fairly, there does look to be enough pressure to give himself a chance. If he finds his right form, he is one of the chances. I start in race one, with SEA THE SPARKLE for Darren Weir and she wears the Waratah Thoroughbreds colours. I have had one ride on her for a win when she resumed two starts back. Last start it was reported that she had a slow recovery. She has since had a little break and steps up to 1600m, has drawn a favourable gate and gets in on the minimum. The softer the track the better for her as she has is unbeaten in both soft ground runs. This is a very competitive race but on her best form she is one the main chances. FURSA is my ride in race three, for Darren Weir and she wears Sheikh Mohammed Bin Khalifa Al Maktoum colours. She is having her first start in Australia after starting her career in South Africa and then last start running at Meydan in Dubai. She is a Group 2 winner as a 2yo and has run second at Group 1 level. If she brings her 2yo form to this race she is going to take a lot of beating. In race five, the Group 3, Quizette Stakes, I ride CATCHY for David & Ben Hayes & Tom Dabernig and she wears the Crabtree colours. She is a Blue Diamond winner and I’ve been looking forward to her coming back after a break stepping out as a 3yo. I did trial her in preparation for this and I was happy the way that she had come back and matured. She is the one they all have to beat. JUKEBOX is my ride in race six, the Group 3, Vain Stakes for Ciaron Maher and he wears Colin McKenna’s colours. He is undefeated and has had a long beak to mature. He comes into this with new shoes which indicates he has matured and strengthened in his feet, which saw him scratched on two occasions in the Autumn. I have trialled him and at his most recent trial he looked to trial very sharply. This is his toughest test to date but I believe he is a topline 3yo and if he has come back and improved, he is going to take a lot of beating in this. Race seven, the Group 2, P.B. 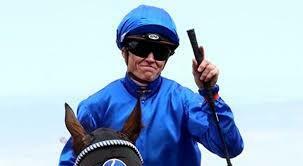 Lawrence Stakes, I ride HARTNELL for James Cummings and he goes around in the Godolphin colours. He is the second highest rated horse in Australia behind Winx and the stable has reported he has trained on really well into this first up run. It is a quality field but without Wink in it, I believe he is the best horse and will take a lot of beating. SOUCHEZ is my ride in race seven, the Listed, Regal Roller Stakes for James Cummings and wears the Godolphin colours. He hasn’t raced since November, so he’s been off the racetrack for a long time. He had very solid form as a 3yo and he has trialled nicely in Sydney and I expect him to be closing the race off strongly. After having a very pleasing season, winning my 6th Victorian jockeys premiership, I was able to have a nice holiday with my family. This is my first meeting back for the new season and I’m looking forward to kicking off on a winning note. I start in race one, with ESPERANCE for James Cummings and Godolphin. He is a very exciting 3yo who was impressing winning on debut at Echuca when he won by 8 lengths but more significantly was the time he ran. I expect him to improve with confidence and experience and make it two from two today. WASSERGEIST is my ride in race three, for Trent Busuttin & Natalie Young. He has had one start and ran very well at the course and distance. He has had a break between runs and if he has come on, he is the horse they have to beat. In race eight, I ride DANCING HARE for Lee & Anthony Freedman. I won her maiden two preparations ago and I thought she was a nice progressive filly over a trip. Last preparation, she didn’t live up to that expectation. I expect on her best form to be closing off well at the end. I start this last meeting of the 2016/17 season three ahead of Beau Mertens in the race to the Championship. I start in race one, with DIVINE CHILLS for John Sadler. She will have confidence after her last start victory but she has come up with the outside barrier draw. She can be versatile as she sat outside the leader last time and she has also won at Flemington over the same distance being ridden back. It will be interesting the instructions I get and it could be dictated by the strong winds forecast. CHARLEVOIX is my ride in race two, for David & Ben Hayes & Tom Dabernig. This a restricted race for VOBIS Gold horses only and although my horse has 59.5kg he is extremely well treated at the weight scale. He has been a model of consistency at his last four starts and he is also back to 2400m and on his most recent form he should be too strong a stayer for these. In race three, I ride SHAMPORT for Darren Weir. This is also restricted to VOBIS Gold horses. He has only had one start and he stayed on nicely and now he steps up in trip. It is a competitive race at the top of the field and I expect him to be finishing off strongly. WINDBERN is my ride in race five, for Mick Price. She was successful last start in a very similar field and only goes up slightly in weight. She has come up with a very favourable draw and can make all or also take a sit like last time. She was strong late and comes into this race with confidence and from the draw she can make it back-to-back wins. Race six, I ride NIL DESPERANDUM for Patrick Payne. She resumed this preparation with an impressive win in the country and now steps up in grade. For the trainer to be running her in town, gives me confidence that he has a strong opinion of her. With an economical run, just above the minimum weight and with confidence from her last start win I expect her to be extremely competitive. WAYANKA is my ride in race seven, for Chris Waller. I rode him two start ago at Flemington when I felt he over-raced but still ran extremely well. He has had a slight freshen up, had the ear muffs applied and goes back in trip. He closed off strongly last time at this course and distance and meets much the same opposition better at the weights. He has drawn favourably and I expect him to be winning. In race eight, the Bletchingly Stakes, I ride ABILITY for Robert Smerdon and he wears the colours of the late Phil Sly. Since being gelded, he has had three starts this time in and been victorious on each occasion. He now steps up to WFA conditions and is back on his home track and drawn nicely. I’m confident he can measure up to this grade and make it four in a row. Race nine, the last race, my ride is COSMIC LIGHTS for Peter Morgan. I had my first ride on him two starts ago at this course where he was unlucky. I got a good feel of him and understand now how he likes to be ridden. Since then he was very competitive in the Winter Championship. He now comes back to a ratings race and is only 1.5kgs off the minimum and I feel he can finish off my good season with a win. I start this meeting two ahead of Beau Mertens in the race to the Championship with two meetings to go. I start in race one, with TAN TAT TRUSTING for Henry Dwyer. He has only had one start and he closed his race off nicely and now steps out in trip which looks like it will suit him. The trainer must have an opinion of this horse to target a city Maiden. If he has come on with that run with experience, he will go close to winning. PERUGGIA is my ride in race two, for Darren Weir and he wears the Australian Thoroughbred Bloodstock colours. He was impressive at his latest start when he beat the older horses at Donald. He now comes back to 2yo company but he has drawn an outside gate so hopefully he doesn’t have to do too much work and if that’s the case, he will take a lot of beating. In race three, I ride IT’S A SHAME BILLY for Udyta Clarke. He has been an ultra-consistent horse without winning and hasn’t won for over 18 months but his last start was an excellent run at the track over 1200m. He now steps up to 1300m and the longer straight should be too his advantage as he is a horse that gets back. He has only had one start at the distance for a second and in this very competitive Benchmark race, he is one of the main chances. ACCELERATO is my ride in race four, for Tony Noonan. He has been very consistent this preparation and last start got a well deserved win so he comes into this with confidence. His win was on a Heavy 8 so any rain wouldn’t hinder his chances. He appreciates when there is a lot of speed and pressure in his races and this looks to be the case on paper with the main speed drawn wide. He has a widish draw but recently on the Hillside track it has been a huge advantage to be drawn wide on the sprint course. He is one of the leading chances. Race five, I ride HIGH LAGO for Darren Weir and she wears the Australian Thoroughbred Bloodstock colours. I’ve ridden her on one other occasion when she finished third at Cranbourne. At her latest start she had the blinkers on for the first time and she closed off really solidly for a second at the same course. She now steps up in trip and she has come up with a wide draw but if I can find a nice position, I expect her to be really strong late. PLUS EFFRONTE is my ride in race six, for Archie Alexander. The stable has a big opinion of this horse and he has been a very consistent horse. Last start, he was victorious so he comes into this with confidence. From an inside gate, he should get an economical run behind the speed and hopefully he can make it back-to-back wins. In race seven, I ride PRECIOUS JOURNEY for Paul Preusker. I have ridden her at her last two starts. I was really happy how she closed off last time and it was difficult to make ground on the day so the run plenty of merit. 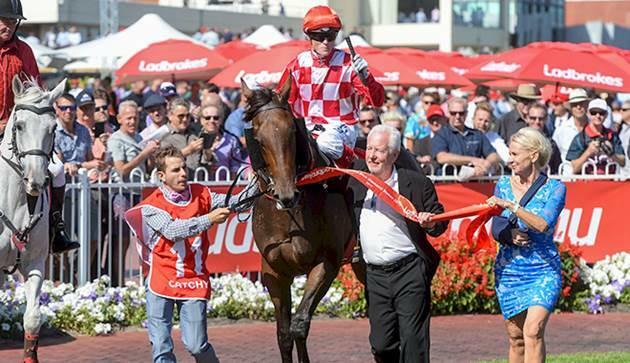 The winner of that, franked the form by winning at Flemington on Saturday. She now steps back in grade and is very well handicapped being a mare in this open race. The longer straight of the Hillside track will be too her advantage and I expect her to be winning. Race eight, the last race, my ride is SACRED THEME for Robert Smerdon. He is coming off a last start victory and now steps up slightly in trip. He does get back so the wide draw doesn’t look to be a disadvantage. In this very competitive race, he is one of the main chances. I start this meeting level with Beau Mertens in the race to the Championship with three meetings to go. I start in race one, with GERVAISE for Danny O’Brien. He has won at the course and distance and only missed a place once form his four tries at Flemington. He is second up, where he has been successful before. He ran well first up and he now steps out to a trip that he enjoys and he’s come up with a nice middle barrier. In this competitive race, I expect him to hold his great Flemington form and hopefully make it two from two at the course and distance. ANCHOR BID is my ride in race three for Darren Weir and she wears the Pinecliff Racing colours. This race has been put back on the racing calendar for 2yo’s over 1800m and if she wins she will automatically gains a start in the VRC Oaks. On all three of her race starts she has been closing off really well and the step up in trip will suit her.Her form is superior to that of her rivals and she is the horse they have to beat. In race four, I ride PORTMAN for Danny O’Brien and he wears the Qatar Bloodstock colours. 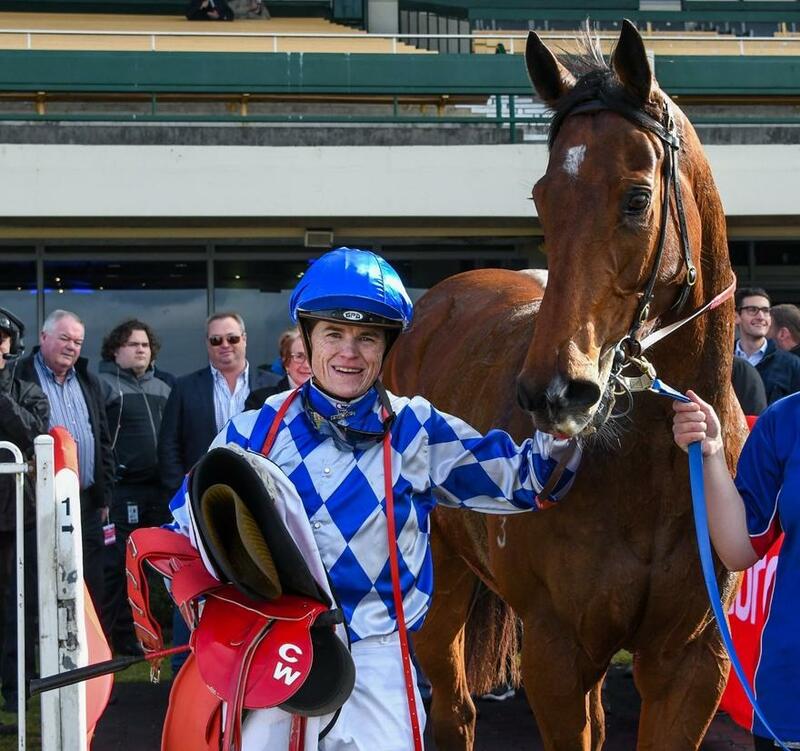 He resumed with a nice run at Caulfield and he now steps out to 1400m and he’s never missed a place at Flemington. He has come up with a nice barrier draw, there looks to be nice pressure in the race. Carrying a light weight, he is going to take a power of beating. BALCAZAR is my ride in race five, for Lee & Shannon Hope. He has been racing well at his recent runs including last start at this course in the Silver Bowl Final. He has been closing off nicely but he does get back. If the track is playing evenly, I expect him to be one of the strongest late. Race six, I ride DIVINE MR ARTIE for Brendan McCarthy. My first ride on him was 12 months ago when I was successful at Caulfield. Since then I have partnered with him to win at this course and distance. His first up run was very good and the trainer is confident that he has filled out and matured now and I’m looking forward to getting back on him. He has good straight track form, is well weighted and he is going to take a lot of beating second up. MAGIC CONSOL is my ride in race seven, for Paul Preusker. He has been a model of consistency, not finishing out of the top two at his last three starts. He now steps up to 2000m and the trainer is confident how he has trained on since his last outing. He has come up with a nice middle draw, is versatile how he can be ridden and has the minimum weight. In this small field, that doesn’t look like there will be much pressure to Lord Durante, I will have plenty of options and he should be hard to beat. In race eight, I ride MOONLITES CHOICE for Darren Weir and he wears the John Richards colours. She is on the quick back up after I won on her last Saturday and this is her first time out to 1400m. I felt she was really strong last time and will appreciate getting out to this trip. She has come up with a really favourable barrier on the inside and with confidence from her last start victory she will take a lot of beating. Race nine, the last race, my ride is KNOWABLE for Steve Richards. This talented 3yo is resuming after a consistent Autumn campaign that included a placing at Group 3 level over 1400m. He won first up last preparation and has won at the track. This is his first start down the straight but he is trained on the track and will have had experienced it before. I have ridden him in a couple of recent jumpouts where he pleased me and I expect him to be one of the leading chances in this very competitive race. I start this meeting one behind Beau Mertens in the race to the Championship with four meetings to go. I start in race one, with TRISCILLA for Ciaron Maher. I rode her on debut and she was very green. Since then, I have trialled her at Caulfield and I was happy the way she has progressed with experience. She has come up with a nice middle barrier draw where half the field are first starters. If she has come on since her first run, she will be competitive. HOLY BLADE is my ride in race two, for Darren Weir and wears the Yu Long Investments colours. He won on debut and was very impressive when he made all the running. Last start, he began awkwardly and had to do all the chasing, where he closed off nicely. He comes into this with experience at the course and distance and also has the addition of blinkers for the first time. It is a competitive race but he looks like a horse with a nice future. In race three, I ride BRAHMOS for John Sadler. He is a first starter but I have worked him at the course and he gives me the feel of a horse with nice ability but he is stepping into a very competitive Benchmark race. He has drawn a nice barrier and if he handles the day well, he will make his presence felt. SHEWEARSTHEPANTS is my ride in race four, for Darren Weir. I was really impressed with her run when she resumed at the track. She now steps up to a distance that she won her Maiden over. She has a nice barrier but she usually finds herself midfield or behind so she will need some luck in running. It is a competitive race but I expect her to be closing off hard. Race five, I ride AYERS ROCK for Shawn Mathrick. He is now dropping down to his right grade after running well last start in a stronger race and he is now third up. He has an outside draw so with luck in running and if he doesn’t have to work too hard he will take a lot of running down. GIBBON is my ride in race six, for Wendy Kelly and he wears the Ken King Thoroughbred colours. His last two starts I have been successful on him with his latest being at the course and distance. He has also come up with an inside draw which was a disadvantage last start but he was still able to get the right run and finish strongly. He has been really well placed with his runs being spaced where he seems to perform at his best. He comes into this race 1kg off the minimum and has confidence after his last two wins. He does get back so will need a little luck but he is a horse in form and I’d like to make it three from three. In race seven, I ride KELLSTORM for Darren Weir and he wears the OTI Racing colours. He won at his first start and in Australia and since then he has been very competitive without winning. He now steps up in grade, stays at the same track and trip as last time but now gets in on the minimum weight of 54kg. He has come up with a wide barrier but if he can get a nice position he will be making his presence felt in this small but competitive field. Race eight, the last race, my ride is SMOKIN’BELLA for Ciaron Maher. She has been in impeccable form this preparation winning two from two. She has had her runs spaced which has worked well for her. She has drawn well but she gets back, so if the track is playing evenly and you can make ground, she can win again. I start in race one, with ORIENT LINE for John Moloney. He started his racing career winning his first two starts but before his last start win it was nearly two years between victories but I was impressed with his last start performance as he was dominant. He has been very consistent this preparation and that confidence will put him in good stead for today’s race. He does have a get back run style and is strong late. With the rail out 10 metres, if the track is playing even, I expect him to be hitting the line strongly. ALJAWZAA is my ride in race two, for David & Ben Hayes & Tom Dabernig. She is second up this preparation after going down narrowly at Sandown. She did win on debut and was then put away. Prior to that victory she trialled well against Tulip. She has come up with a favourable barrier draw and should get a lovely run from there and with a run under her belt, she will take a lot of beating. In race three, I ride MOONLITES CHOICE for Darren Weir. She won two starts ago over 1200m and then she was freshened up last time, where I rode her, over 1100m. She didn’t have any luck as she was in restricted galloping room and wasn’t fully tested. She now goes back out to a trip that she has been successful at previously. There looks to be nice pressure in this and if the track is playing even I expect her to be running over the top of them late. ALL OUT OF LOVE is my ride in race four, for David & Ben Hayes & Tom Dabernig. He has had two runs at this course and distance and hasn’t missed a place. He has drawn a wide gate but his run style is that he usually gets back. There looks to be nice pressure in this race and if they go at a really good gallop, you’re going to need a strong horse late and that’s what this horse looks like. I expect him to continue on his good form at this course and distance. Race five, I ride BLING DYNASTY for Paul Preusker. I have only had two rides on this horse for two wins but they were at Moonee Valley over a longer distance. He has come back from a long lay off with two very good runs. At his latest start over 1400m, he closed off very nicely with good form since coming out of that race. He is a horse that gets back and I expect him to be closing off solidly. ENIGMAN is my ride in race six, for Ciaron Maher. I finished second on him last time at the course and distance and he was only narrowly defeated. He is against similar horses again but the top two do meet him better at the weights. He has a nice middle barrier and does have a gear change. If he has a similar type of run and can find half a length from his last outing, he will be winning this. In race eight, I ride BEATNIKS for Matthew Dale. She is resuming this preparation and has only missed a place once in her five first up runs. She has won at the distance and her last three starts have been in Stakes company, so she is right back in grade. She is carrying the maximum weight due to her consistency and great form and I expect her to show her quality. Race nine, the last race, my ride is HERE TO THERE for Ciaron Maher. He is a very consistent horse and was only narrowly defeated at the course and distance last time out. He is now stepping up from a rating race to an Open Handicap but he does drop nicely in weight. He has drawn the outside gate and he is a horse that is usually on speed. If he doesn’t have to work too hard early, he will take a lot of running down. I start in race one, with STREET IMPACT for Robert Smerdon and Ultra Racing. She is having her first start and she has trialled once officially on the synthetic at Pakenham but I have worked her at Sandown leading into this and I have been impressed with her. She feels like a filly with above average ability and I expect a forward showing. OCEAN MAGIC is my ride in race two, for Shane Nichols. She won two starts back at this distance and then she had her first run at Sandown last start but was back to 1000m. She now steps out to the distance she won at and from an outside draw I would expect her to be working home. If the track is playing even, she should be finishing off nicely. In race three, I ride SEA THE SPARKLE for Darren Weir for Waratah Thoroughbreds. 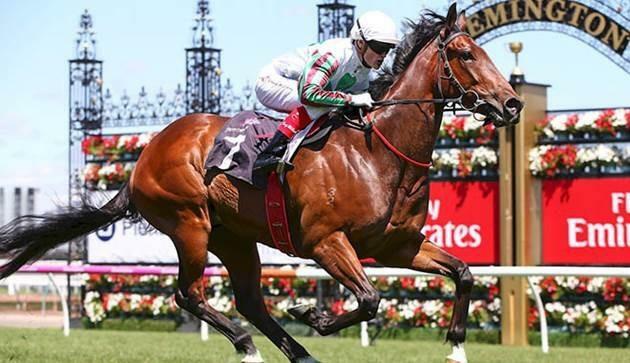 She has only had three starts and she has won two of those and at her latest start she was beaten less than four lengths over the Spring Carnival at Flemington behind Tavi Bay. She is resuming and has a nice inside draw, so she should get an economical run. If she has improved or holds her form from last preparation, she is one of the main chances. POWDERWORKS is my ride in race four, for Darren Weir and Australian Bloodstock. She has been a consistent mare who hasn’t won since this time last year. If she recaptures her form that saw her finish second in the Pinker Pinker Classic, she would be one of the main chances in this small field and tactical race. Race five, I ride YOGI for Darren Weir and Australian Thoroughbred Bloodstock. I ridden him twice for his last two wins at the track but on the longer Hillside course. He is on the Lakeside course but he is stepping up in trip which I think is a benefit for him. He does take a lot of riding but he has untapped potential and if the race is run to suit and the track is paying evenly, he will be too good for these. HE’S A MORAL is my ride in race six, for Darren Weir. He ran very well first up when he just missed. His second up form is excellent as he has had two goes for two second. He has come up with a very favourable barrier draw in gate one and he should get every chance and take a lot beating. In race seven, I ride PRECIOUS JOURNEY for Paul Preusker. I had my first ride on her at Bendigo last time. She was never fully tested as I couldn’t gain a run all the way up the straight. This is a competitive race that looks to have a lot of pressure up front which should suit her and from a favourable barrier I expect her to be one of the strongest horses late. Race eight, the last race, my ride is GALAXY RAIDER for Greg Eurell. Last start I had no luck on him at all at Bendigo. I’ve had two rides on him and now I have a good understanding of him. He is a get back horse but if the track is playing fairly then he should be too good in the run home for these. YOU WOULD THINK is my ride in race two, for David & Ben Hayes & Tom Dabernig. This is her first run for the new stable. She has trialled well coming into this and the widish draw will give her some room which she appreciated in her trial. She did trial well enough to be winning this race. In race three, I ride SAILBOAT for David & Ben Hayes & Tom Dabernig and wears the Coolmore colours. She is resuming and has trialled very nicely leading into this race. She is a horse that will appreciated getting out to a longer distance later on but this does look a winnable race first up this preparation. I start in race one, with OLYMPIC LAD for David & Ben Hayes & Tom Dabernig. I rode him on debut when he was unlucky. He drew the outside and I went back on him and he wasn’t fully tested as he had a lack of room in the straight. Once he did get clear, he gave me a really sharp burst and I was impressed with his performance. I expect him to improve with the experience and being drawn better today he should be one of the main chances. ATLANTIC FOX is my ride in race two, for Jason Warren. He has been very consistent this preparation for two wins from three runs. 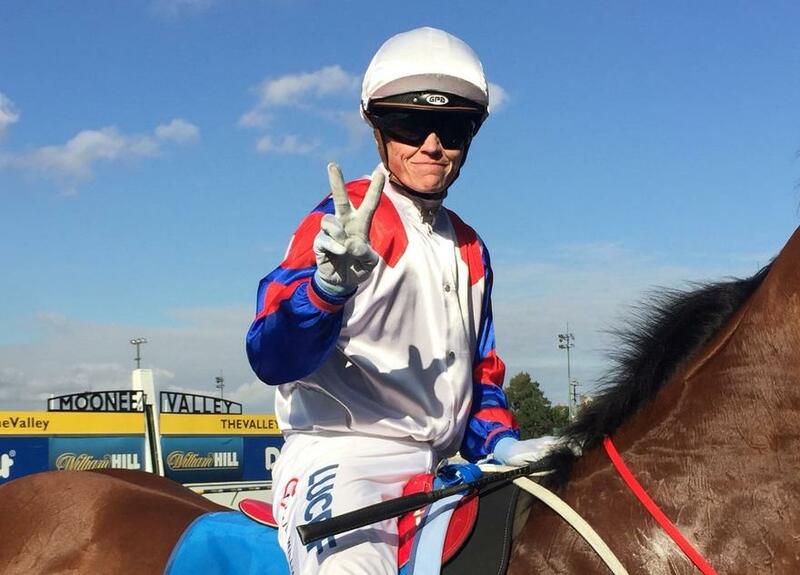 His latest win was at Echuca on Monday where he had a big weight and beat the older horses. He now steps up to 2000m on the quick back up but he has come up with the outside barrier draw but he does get back in the races. If he has some luck in running he will make his presence felt. In race three, I ride COSMIC LIGHTS for Peter Morgan. He has been in good form this preparation and has come up with a good barrier draw. The race looks like it will be truly run and if I can utilise his barrier draw and in this grade, he is one of the main chances. MOONLITES CHOICE is my ride in race four, for Darren Weir. She has raced twice at the course and distance in strong races and hasn’t been beaten far. This is a strong race again today but she has come up with a nice middle gate and she should have confidence after her last start win. With luck in running, which she does need when she gets back, she will be closing off hard. Race five, I ride A LOTTA LOVE for Sam Pritchard-Gordon. She has won at the course and distance and her last two starts have been in Group company so she is back in grade. She has had her runs spaced coming into this and she is quite versatile. She is one of the main chances in this small but competitive race. ENIGMAN is my ride in race six, for Ciaron Maher. He’s only lightly raced for two wins from his four starts. At his last start, he was successful at Bendigo where he beat the older horses under a big weight. He comes into this race with confidence and is back against his own age group and comes into this race with a great barrier and on the minimum weight. He is a horse that is going to take a lot of beating. In race eight, I ride ACT OF VALOUR for Henry Dwyer. He has been very consistent this preparation and hasn’t finished further back than second. He has had his races spaced and if he holds his form, he is going to take a lot of running down. Race nine, the last race, my ride is MAGIC CONSOL for Paul Preusker. I have been really impressed with his last two performances being successful two starts back and only narrowly defeated last start. He now steps up to a distance he has relished in the past having won three times from four tries. He also gets in 1kg off the minimum and if he brings his recent form, they won’t beat him. I start in race one, with TATA MADIBA for David & Ben Hayes & Tom Dabernig. This lightly raced Nicconi colt was narrowly defeated last start on Heavy ground. He does have the experience of a run this time in but he does look like a horse that wants to get on with his races and over quickly. I have to hope he works well with me as he has come up with outside barrier draw and this does look to be a very competitive race. With luck from the draw, he will make his presence felt. TRISCILLA is my ride in race two, for Ciaron Maher. She was an expensive Exceed And Excel filly who is a half-sister to Lucia Valentino. I have seen her trial unofficial at Caulfield and I have sat on her in a piece of work. She is a speedy horse that has nice ability and I’m looking forward to seeing how she handles her first day out at the races. In race three, I ride AIRINO for John Sadler. This race is over 1000m which is her favourite distance as she has only missed a place on two occasions. I rode her when she finished second two starts ago at Pakenham on a Heavy track. Last start she was upset and cranky and also fractious in the barriers and the race didn’t work out for her. She has come up with the outside barrier draw but she is in her right grade and if she brings her best form, she will take a lot of running down. CAT WOMAN is my ride in race four, for John Sadler. She is only lightly raced and has one win to date. She is a horse that makes all the running and she has come up with an outside barrier draw but if I don’t have to do too much work and she races kindly for me, she will give a good kick at the end and take a lot of running down. 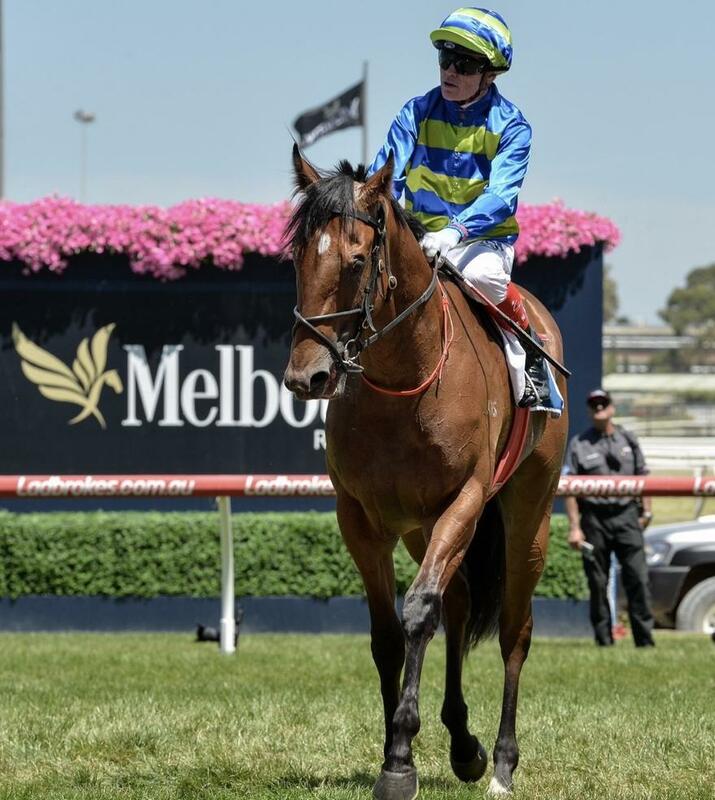 Race five, I ride YOGI for Darren Weir and Australian Thoroughbred Bloodstock. I was successful on him last start at the same track but he now steps up in distance which looks like it will suit. He is a horse that always gets a long way back in his races and takes a lot of riding but after having a ride on him I have a very good understanding of him. If he brings his current form and has gained confidence from the win, I expect him to be winning again. CONCUBINE is my ride in race six, for David & Ben Hayes & Tom Dabernig. She won first up this preparation at a short trip and then last start on the Soft ground she wasn’t happy going down the hill. She now steps out to the long course that should suit her better. There does look to be high pressure in this and the firmer surface will be to her liking. In race seven, I ride GIBBON for Wendy Kelly. He is a horse coming off a last victory on Heavy ground. I have ridden him twice and have a really good understanding of him. He does like galloping room late and he has come up with an inside barrier draw. I will have to see how the track is playing by then but if I can get away from the inside to a comfortable position I expect him to be one of the main chances. Race eight, the last race, my ride is RAINDROPS ON ROSES for David & Ben Hayes & Tom Dabernig. I had my first ride on her last time when she finished second at the same distance. She now steps out on the bigger course but unfortunately draws an outside barrier but she is a horse that can be ridden effectively forward or back. She is very fit, extremely consistent, in on the minimum weight and if she has luck from the draw she is one of the main chances. I start in race one, with AMSCHEL for David & Ben Hayes & Tom Dabernig. This colt has had two starts, where he failed on debut then returned with a fast finishing third on the Geelong synthetic track and from that race, two horse have won since. The step up in trip should suit him, he has a nice middle barrier draw and I expect him to be one of the strongest horses late. GOUGERS is my ride in race two, for John Sadler. He started this preparation with a win at Geelong over 1200m, then I rode him at Cranbourne over 1000m where he got back from a wide barrier draw and wasn’t able to get clear running until late and he steamed home once he got clear. He then stepped up to this grade and ran very well for his first time down the straight. He has come up with a nice middle draw and with the experience under his belt he is a very strong chance. In race four, I ride SAYED for Chris Waller. 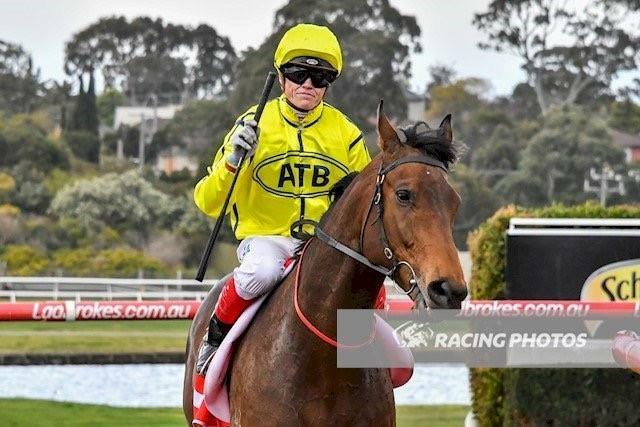 This American bred gelding was successful last start at his first try in Melbourne when I won on him making all the running at Sandown. I thought he was very gallant as he made the pace and fought on hard. He stays in the same grade but goes up in weight. I expect him to have confidence and the barrier should give me an economical run and I know he will be strong late as he is back in distance. CHARLEVOIX is my ride in race five, for David & Ben Hayes & Tom Dabernig. I have only had one ride on him for a win two starts back at Cranbourne in a BM78 grade. He then stepped up to this grade and was beaten two lengths. He now has the addition of blinkers and if they can find him the two lengths, he can win this. Race six, I ride ABILITY for Robert Smerdon. I expected him to run well first up as he had been gelded and had worked and trialled well leading in and he took that to the track under race conditions. The stable has been happy with the way he has trained on and that’s why they have stepped him up to this level. With the minimum weight and the experience of racing down the straight, it looks like he can make it two from two this preparation. REWARDING EFFORT is my ride in race seven, for Cindy Alderson. The trainer has targeted this horse for the race and he has come up with a nice inside barrier so he should get an economical run and this is his favourite distance. With luck in running and on the minimum weight he can make it three from three at the mile. In race eight, I ride INVINZABEEL for Chris Waller. He is having his first run in Melbourne and gets into this race on the minimum weight. The stable has advised me he appreciates racing room when placed under pressure. With the barrier and the likely high pressure in this race the field should spread out and give him his chance to show his best. Race nine, the last race, my ride is WAYANKA for Chris Waller. He is having his first run in Melbourne and he has been extremely consistent this preparation. He started off this preparation with two wins at 1200m and at his latest run over 1500m he was beaten less than a length carrying 60.5kg. He comes into this race with a favourable barrier draw that should give him every chance to run out the distance and get around the left-handed way. He has a nice weight only 1.5kg off the minimum and he should get every chance. I start in race one with ALL WELL for Robert Smerdon and he goes around in the Waratah Thoroughbreds colours. He won four starts back over the hurdles and in between his other two hurdle starts I finished third on him at Cranbourne over 2060m and he was beaten home by Diamond Grace who lines up in this race. He will appreciate the extra trip of today’s race as he is a true out and out stayer and usually finds himself forward and he will take a lot of running down in this competitive event. DESTINY’S AWAKENING is my ride in race two, for Brian Gentle. He has had seven starts and been placed three times. He is trained at the track and at his most recent start he was beaten less than three lengths. He is a horse that seems to get back in his races and he has drawn a wide barrier. If the track is playing fairly I would expect him to be closing off strongly. In race three, I ride OLYMPIC LAD for David & Ben Hayes & Tom Dabernig. He is a Bel Esprit colt having his debut run, as is most of the field. He has come up with a very wide draw and he hasn’t trialled officially. I have seen him trial unofficially at Flemington and he showed good speed and was solid through the line but he will need everything to go right from this outside draw. PRECIOUS JOURNEY is my ride in race four, for Paul Preusker. She is a mare that won three starts ago but that was in late 2015. After that impressive win, she had more than a year off. She has had two runs this preparation and she has been encouragingly improving each start. She now gets out to a distance range she looks better placed at. She has come up with a good barrier draw and she should get an economical run from the inside gate. It is only a small field that looks to lack pace and if she can find her form from a preparation ago, then she can win this. Race six, I ride WILLI WILLI for Craig Widdison. He was unlucky last start when he was outsprinted at the top of the straight at Sandown and then I was unable to get clear running late. He now stays at a similar trip. I have a lot of time for him and I was impressed with his win first up this preparation and then he went up in grade and ran well at Flemington. If he has luck in running, I expect him to be too strong in this line-up. GALAXY RAIDER is my ride in race seven, for Greg Eurell. He has had excellent form throughout his career and I was excited to ride him first up at Sandown. He did begin awkwardly out of the gates and subsequently I felt it affected his performance as he was very disappointing. He has come up with a wide barrier draw and he will get back but if the track is playing evenly, there does look enough pressure in this to allow him to finish off strongly. In the last race, race eight, my ride is DESTINY’S REWARD for Brian Gentle. He is trained at the track and first up after a freshen. He has had four first up attempts and has only been unplaced once. He races well at the course and distance and come up with a nice middle barrier draw. This is a very competitive race but on his best form from two preparations ago, he can be winning this. I start in race one, with ROCKETCOD for David & Ben Hayes & Tom Dabernig and he wears the Australian Thoroughbred Bloodstock colours. He has raced before on a synthetic surface when he resumed at Geelong this preparation where he closed off nicely for second. At his latest start, I rode him over the same distance but it was on a Heavy 9 where he travelled nicely but he failed to respond on the wet track. He gets back onto the synthetic surface, which he is proven on, and in a very soft maiden with an economical barrier, he is the one they have to beat. ST VADUZ is my ride in race four, for David & Ben Hayes & Tom Dabernig. This colt is on debut and he hasn’t trialled officially so I’m looking forward to seeing him in the yard. There does look to be a lot of pressure on paper and he has come up with a wide barrier for his first start. If the stable is confident, they will know where he fits into the mix as they have had an amazing season of great results with their 2yo’s. I start in race one, with TRULY DISCREET for Dan O’Sullivan. At her first start she ran over the same distance on her home track where she was a little bit slow into stride and was never tested as the runs didn’t come for her. She was beaten less than two lengths and with any luck should have had a win next to her name. I expect her to be competitive in this even race. AIRINO is my ride in race two, John Sadler. I rode her last time on a Heavy track at Pakenham and she comes into this race with the blinkers going back on. I have experience riding her and I think the blinkers will be beneficial. She is a very fast filly that dominates races from the front and she should be suited by the tight turning track. She is a specialist at this distance and if she doesn’t have to work too hard from the draw, she will take a lot of running down. In race three, I ride MISS VISTA for George Osborne. She is the people’s favourite as she is a standout looker as she is a painted horse with a lot of white markings. She is also very consistent mare that has been lightly raced and is a specialist at this distance but she has drawn a wide gate. There appears to plenty of pressure and if she gets a good run from the draw her form is the strongest in this race and they’ll find it hard to beat her. DULVERTON is my ride in race four, for Robert Smerdon and she wears the Qatar Bloodstock colours. She is third up this preparation and closed off nicely with a big weight last time and she gets back to a track that she has been successful at. She will need some luck as she usually gets back and she has drawn wide so hopefully the track is playing fair and they can work home from back. I expect her to be closing off fast. Race five, I ride RUETTIGER for David & Ben Hayes & Tom Dabernig. I was successful on this horse nearly 12 months ago but it was at Flemington and today he has to negotiate two turns. Even though this is an open handicap sprint race, there doesn’t look to be much pressure on paper but fortunately he has drawn well. He is second up and has the blinkers off and he can be keen in his races but if the gear change works and relaxes well, I expect him to be strong late. HIGHLAND BEAT is my ride in race six, for David & Ben Hayes & Tom Dabernig. He has had no luck at his last two starts and hasn’t been fully tested. I rode him last start at this course and distance where he drew the outside barrier. He usually gets back and finishes off, unfortunately I had no room in the straight last time to test him and he was totally luckless. He is taking on similar horses and he has come up with a good barrier. If he has good luck, he will be winning this. In race seven, I ride HURSLEY for Chris Waller and he wears the Qatar Bloodstock colours. He is a very consistent horse and he has at this course and distance twice and he has finished third on both occasions. The first time he was beaten behind Big Duke and then last start he was unlucky when beaten by Gallic Chieftain. He has come up with a favourable barrier draw but he is versatile as he can be ridden forward or off the speed and be effective both ways. He comes into this race on the minimum weight and has a favourable barrier draw and with luck in running, he should be winning this race. Race eight, I ride MAGIC CONSOL for Paul Preusker. This a very special race to me, run in the honour of my cousin, the late Travis Harrison. I was successful on this horse last start at the course and distance when he was down in grade but had a big weight and I was impressed the way he won. He has confidence and the minimum weight today but unfortunately, he has drawn the outside so he will need some luck. It is a very competitive race but with luck from the draw he will be one of the main chances. In the last race, race nine, my ride is FLORAL FEVER for Symon Wilde. Symon has one of the best strike rates in Victoria this season and I’m always confident riding one of his horses when he brings them to town. He is an ultra-consistent horse and this seems to be his favourite distance. He will end up jumping form a nice middle barrier draw and watching his replays he appears quite versatile so if there is a track pattern he can be ridden accordingly. After a confidence boosting win last time, he is one of the main chances and the horse they have to beat. I start in race one, with ORACABESSA for Robert Smerdon. She hasn’t been getting beaten far this whole preparation and had the blinkers on for the first time last start where she rode the speed and wasn’t far away on the line. She is now back in trip, has come up with a favourable barrier and in this moderate city maiden, she looks to be one of the main chances. LORD TENNYSON is my ride in race two, for Peter Chow. His only disappointing run this preparation was last start when coming off a quick back up which he hadn’t done before and it was a race that suited horses from off the speed. He has had a nice freshen up coming into this and he has pleased the trainer since his last start. If he brings his usual form he will take a lot of running down. In race four, I ride LADY LEE for David & Ben Hayes & Tom Dabernig. I finished third on her last time when she drew the outside and the saddle slipped. Her effort was very good as she was awkward to ride out. She has come up with the inside barrier so she should get an economical run and she is one of the main chances in a competitive race. BRASSY BELLE is my ride in race five, for Chris Waller. She is coming back in grade and only goes up 0.5kg in weight. She also has the blinkers off for the first time and has come up with a favourable barrier draw. If she finds her Sydney form she will be thereabouts. Race six, I ride RAINDROPS ON ROSES for David & Ben Hayes & Tom Dabernig. She has a good barrier, is on the minimum weight, is fit and she has also been competitive at the track and distance. It is a competitive race but with the right run and her holding her form, she is one of the main chances. YOGI is my ride in race seven, for Darren Weir and he goes around in the Australian Thoroughbred Bloodstock colours. He has won the track and he started this preparation with a fast finishing second. He has come up with an outside barrier draw but he always gets back in his races and usually finishes off hard. If the race is run to suit him and horses can make ground on the day, he will be finishing strongly over the top of them. In race eight, the last race, l I ride CHAMPAGNE READY for Chris Waller. I like her slightly back in trip to 1400m from the 1600m. She has come up with a widish draw but she is hard fit and I like the way she is racing. I’m going into this race very confident and if the track is playing fairly, she is one of the main chances.